Run Now Relay: 1000 Miles, 8 Days and 26 Runners Raise Funds in Honor of Boston and to Support Dream Big! When the bombs went off at the finish line of the Boston Marathon last April, the actions triggered anger for the death, destruction and mayhem it caused to the victims, their families, and the American people. While the attack on one of the most historic events was horrific, it strengthened the running community, which resolved that no cowardly act would dampen the spirits of this tight-knit group of athletes. That resolve reverberated around the globe and has sparked numerous commemorative running events in honor of Boston. One group of runners in Tennessee will be taking their spirit of support to the streets when they embark on the Run Now Relay (RNR) set to begin on Saturday, April 12, 2014. 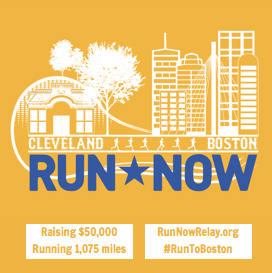 The running group has committed to an epic 8-day relay run departing Cleveland, Tennessee on April 12 and arriving in Boston on April 19th, two days day before the 2014 Boston Marathon, appropriately held annually on Patriots Day. The runners, ranging in age from mid-20s to early 60s, will run non-stop, 24 hours a day through eight states and over 1,000 miles, hitting metropolitan areas such as Knoxville, Tennessee, Washington D.C., Baltimore, Philadelphia, and New York City. Ultimately, the primary focus of the journey is to help support the people, especially the children, of Boston. In that effort, the Run Now Relay team has committed to raising funds for two partner charities. The One Step Ahead Foundation serves the children who have suffered amputations because of the Boston bombing and the second Boston based non-profit, Dream Big! provides girls from low-income and homeless situations with the basic items and fees needed for them to participate in sports and physical activities that contribute to their health, education and overall well-being. The goal has been set to raise $25,000 for each charitable organization. The team is so committed that all costs of the journey have been covered by sponsors. Any remaining expenses not covered by sponsorship, the participants will pay out of their own pockets to ensure every penny donated goes directly to those that need it most. In addition, three members of the Run Now Relay Team, Matt Ryerson, Fred Garmon and Matt Carlson are also official members of the 2014 Dream Big! Boston Marathon Team whom along with 25 other runners will take to the start of the 118th Boston Marathon on April 21st to meet their personal goal of finishing the Boston Marathon. In 1836, Davy Crockett and 65 other Tennessee men signed an oath as volunteers to defend and support their brothers and sisters in Texas at the Alamo,” stated Fred Garmon, one of the organizers of the RNR. “Those volunteers traveled over 1,000 miles to extend that volunteer support for their brothers in arms. Now, 178 years later, over two dozen men and women have signed another oath as ‘Tennessee Volunteers’ to run the entire distance from Cleveland, Tennessee to Boston, Massachusetts in support of our brothers and sisters.” Garmon is president of a nonprofit, which raises awareness and funds for people in Southeast Asia. When the Dream Big! Marathon Team and the Run Now Relay Team cross the finish line in Boston on Marathon weekend not only will their lives be changed forever but together with your support they will have been able to impact the lives of thousands of girls!